Watkinsville voters overwhelmingly approved the Sunday sales of alcoholic drinks in the city’s restaurants and the Sunday sales of beer and wine in the city’s convenience stores in voting in the special election that ended today (Tuesday). Vote turnout was low, but the margins in favor of Sunday sales in the city were even higher than they were when county voters approved Sunday sales last November. Of Watkinsville voters who live in the City Hall precinct, 82.1 percent approved of Sunday sales by the drink and 77.1 percent approved Sunday package sales. For the smaller Annex precinct, 91.3 percent of the Watkinsville voters approved Sunday sales by the drink and 87.0 percent approved Sunday package sales. For the two precincts combined, 84.4 percent of the 186 voters who cast a ballot approved of Sunday sales by the drink, and 79.6 percent approved Sunday package sales. In the county-wide vote on Nov. 8, 68.2 percent of the electorate approved of the Sunday sales of alcoholic beverages by the drink, and the same percent approved of Sunday sales in the county’s convenience stores and groceries. Those November voters authorized the county Board of Commissioners to change the county’s alcohol ordinance to allow for Sunday sales, and the Commissioners did that shortly after the vote, meaning Sunday sales in the county have been possible since early December. The county’s ordinance does not apply to the county’s four cities, and the Watkinsville vote today (Tuesday) will allow the Watkinsville City Council to change its ordinance to allow for Sunday Sales. The Council has said it will meet quickly to make that change. The county’s other three cities–Bishop, Bogart and North High Shoals–do not have restaurants, and Bogart, which alone among the three has a convenience store, has not put Sunday sales on the ballot. Watkinsville has 2,117 registered voters, but only 1,830 of those are active. The 186 votes cast today and in early voting account for only 10.2 percent of active voters. Of those 186 ballots, 140 were cast in City Hall precinct and 40 were cast in Annex precinct. A total of 61 votes were cast in the three weeks of early voting, and 1 vote was cast by mail. The vote totals for the 186 ballots remain unofficial until they are certified later this week. 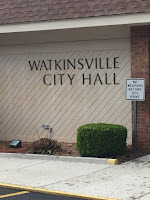 Watkinsville held its own special election in 2015 on the sale of liquor by the drink in city restaurants following approval in November of 2014 of liquor by the drink in the county. Only 265 voters cast a ballot in that 2015 election, representing 15.1 percent of the 1,759 registered voters. Positive votes were cast by 216 of those voters, or 81.5 percent. In the county vote in November of 2014, 64.5 percent of the voters had approved of liquor by the drink. Pat Hayes, chair of the Oconee County Board of Elections and Registration, told me tonight that the cost of the special election held today–which will be billed to the city–will be about $3,000. NOTE: Fran Davis, elections administrative assistant, told me in an email on 3/23/17 that no early voter had been disqualified, as I wrote in the original post. One person did submit an absentee ballot request that was denied because the person was not a city resident. The voting count I had been given at the end of early voting was simply off by 1 but not because of a "disqualification." Watkinsville joins the 21st century.